The Roots is an American hip hop/neo soul band formed in 1987 by Tariq "Black Thought" Trotter and Ahmir "?uestlove" Thompson in Philadelphia, Pennsylvania. They are famed for beginning with a jazzy, eclectic approach to hip hop which still includes live instrumentals.Malik B., Leonard "Hub" Hubbard, and Josh Abrams were added to the band, originally called The Square Roots. The Roots released an independently produced debut album, Organix, in 1993. In 1995, with the label DGC Records, the band released Do You Want More?!!!??!. Two guest performers on Do You Want More?!!!?? !, Rahzel and Scott Storch joined the group. Soon after, however, Storch left the band and was replaced by Kamal Gray. Their next album, Illadelph Halflife, was released in 1996. With Illadelph Halflife the band again gained members in Scratch and Dice Raw. The band's next album, Things Fall Apart, was a breakthrough album in that it was their first album to break the top 10 of the Billboard 200 (peaking at 4). 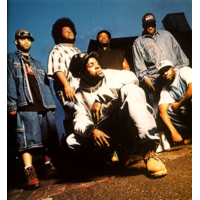 Also in 1999, the band released an EP, The Legendary, and a live album titled The Roots Come Alive. Rahzel, Dice Raw, and Malik B. all parted from the band for differing reasons. In 2000, guitarist Ben Kenney joined The Roots and would stay with the band through their next album, Phrenology, before leaving to join rock band Incubus. After Phrenonlogy, guest performer F. Knuckles became a permanent member and Captain Kirk Douglas replaced Kenney, while Scratch also decided to leave the group. The next album was 2004's The Tipping Point followed by Game Theory in 2006. During 2007, longtime member Leonard Hubbard decided to retire. He was replaced by Owen Biddle. Rising Down, the eighth studio album from The Roots, was released in 2008. Their next album, How I Got Over, was released on June 21, 2010. They have collaborated with a wide range of artists from different genres, including John Legend, Roy Ayers and Cody Chesnutt. The Roots have generated a great deal of critical acclaim and influenced numerous rap and R&B acts. On March 2, 2009, The Roots became the house band on Late Night with Jimmy Fallon.